New York, NY: John Wiley & Sons Inc, 1975. BRAND NEW COPY w/trace edge & surface wear to siliver boards. DJ/None (as issued?). PO name to lower text edge. Textbook. Calculus for application in the social sciences and business. 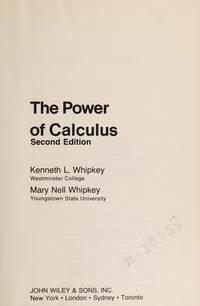 First published 1972; this the 2nd Revised Edition of 1975 w/an added Appendix reviewing basic algebra. 333 pgs plus unumbered. 8 chapters: 1, Review & Preparation for the Study of Calculus; 2, Functions, Inequalities & Absolute Value; 3, Limits, Derivatives & Continuity; 4, Differentiation Techniques; 5, Applications of the Derivative; 6, Integration; 7, Logarithmic & Exponential Functions; Review of The Great Ideas of the Calculus; and 8, Partial Derivatives & Their Applications, followed by 6-part Appendix, and Table of Exponentials & Natural Logarithms. Fine copy.. 2nd Revised Edition, 4th Edition. Hard Cover. NEAR FINE/None (as Issued?). 2nd Revised Edition. New York, NY: Jeremy P. Tarcher/Putnam, 1992. Text/BRAND NEW. Softcover/NF w/trace edge & surface wear. Faint, light brown spotting (acidic paper reaction) to upper text block. 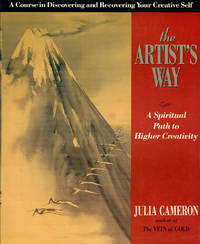 Author Julia Cameron describes book as "a blueprint for do-it-yourself" freeing of creativity energies for artists & non-artists, painters & filmakers, homemakers & lawyers, and ... A 12-week, liberating program. On going activities include 3 pages of writing, on any topic, every morning to erase self-censorhip while making writing habitual, and a weekly block of 2 hours devoted to observing, experiencing, and sensing. . First Edition. 58th Printing. Soft Cover. Very Good/None as Issued. New York, NY: John Wiley, 1997. PLUS: BRAND NEW copy of accompnaying Student Solution Manual (ISBN 047119158). Text/BRAND NEW w/stray ink mark to title page. Illustrated boards/Fine. Fold-out chart to Key Formulas to front/faint creasings to leading edge. Highly favoured textbook for first course in applied statistics; only prerequisite is knowledge of elementary algebra. 13 chapters: 1. Introduction; 2, Organizing Data; 3, Numerical Descriptive Measures; 4, Probability; 5, Discrete Random Variables & Their Probability Distributions; 6, Continuous Variables & the Normal Distribution; 7, Sampling Distributions; 8, Estimation of the Mean & Proportion; 9, Hypothesis Tests About the Mean & Proportion; 10, Estimation & Hypothesis Testing: Two Populations; 11, Chi-Square Tests; 12, Analysis of Variance; and, 13, Simple Linear Regression, supported by 3 appendices and 13 case studies.. 3rd Edition, 4th Printing. Hard Cover. Near Fine/None as Issued. San Francisco, CA: W.H. Freeman, 1982. EX-LIB, college library. Text/BRAND NEW. Green linen boards w/gilt lettering/NF w/trace rubs to edges & corner tips & library label to lower front corner. DJ/None. Library stamps to upper/lower text edges. Readings in basic approach to statistical measurements in the social sciences. 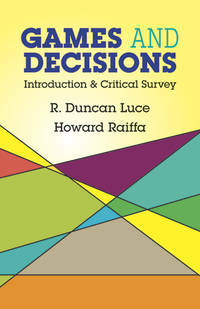 A book designed as to be read prior to enrollment in a statistical course. 10 chapters: 1, Introduction; 2, Frequency Distributions; 3, Measures of Central Tendency; 4, Measures of Variability; 5, Measures of Relationship; 6, Interpreting Individual Measures; 7, Precision of Measurement; 8, Significance of a Difference Between Two Means; 9, More on the Testing of Hyptheses; and, 10, Summary, followed by appendices.. 2nd Edition, First Printing. Hard Cover. Near Fine/No Jacket. New York, NY: Harcourt Brace, 1944. Text/As New, showing faint discoloration. Brick-red linen boards/NF. PO label to front cover verso. Textbook. Fundamental concepts of statistical analysis for both those with little mathematical training and those who have considerable knowledge. 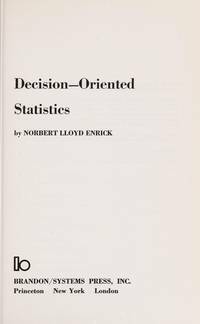 First published in 1934 & enlarged in 1935; this revised edition of 1944 gives greater emphasis to statistical evaluation and statistical induction. 13 chapters: 1, Introduction; 2, Tabular & Graphical Representation: Frequency Distributions; 3, Measures of Central Tendency; 4, Measurement of Dispersion; 5, Skewness: Excess: Moments; 6, Index Numbers; 7, Linear Trends; 8, Simple Correlation; 9, Multiple Correlation; 10, Nonlinear Trends: Curve-Fitting; 11, Permutations, Combinations, & Probability; 12, The Point Binomial & The Normal Curve; and, 13, The Theory of Sampling: Measures of Reliability. Strong copy.. Reprint of 1946. Hard Cover. Very Good/No Jacket. Chicago, IL: Science Research Associates, 1972. Text/Near New w/closed tear to upper text edge of pg 265, & soil spot to pg 6. Gilt embossed maroon boards/Fine. DJ/None (as Issued?) Ink smudge to title on first title page; publishing flaw. Textbook/reference on simulation, a numerical technique for conducting experiments on digital computers involving mathematical models. 15 chapters in f parts: Part I, Introduction; II, Statistical Tools; III, Random Number Generation; IV, The Computer & Simulation; and, V, A Case Study followed by 3 appendices.. First Edition, First Thus. Hard Cover. Very Good/None (as Issued?). New York, NY: Wiley-Interscience/John Wiley, 1977. Text/BRAND NEW w/paperclip shadow to pg 129. Gilt embossed black linen boards/Fine. DJ/None. Textbook. Basic concepts & techniques of statistical inference in scientific studies in medicine and biology. Outgrowth of course lectures delivered at both Stanford and Florida State Univ. Prerequisite: college algebra. 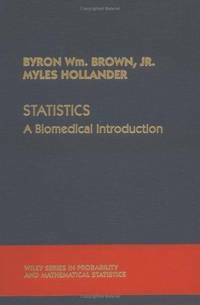 14 chapters, uniquely centered on actual studies in the biomedical sciences: 1, Introduction; 2, Elementary Rules of Probability; 3, Populations, Samples, & the Distribution of the Sample Mean; 4. Analysis of Matched Pairs Using Sample Means; 5, Analysis of the Two-Sample Location Problem Using Sample Means; 6, Surveys & Experiments in Medical Research; 7, Statistical Inference for Dichotomous Variables; 8, Comparing Two Success Probabilities; 9, Chi-Squared Tests; 10, Analysis of k-Sample Problems; 11, Linear Regression & Correlation; 12, Analysis of Matched Pairs Using Ranks; 13, Analysis of the Two-Sample Location Problem Using Ranks; and, 14, Methods for Censored Data followed by 3 appendices. Fine copy less dust jacket.. First Edition, First Printing. Hard Cover. Near Fine/No Jacket. New York, NY: Springer Verlag, 1983. Text/BRAND NEW. Mustard-gold boards/NF. DJ/None. Volume based on lectures delivered at Yale Univ, 1971 - 1981 to students with prepatory work in measure-theoretic probability. 13 chapters: 1, Theories of Probability; 2, Axioms; 3, Conditional Probability; 4, Convergence; 5, Making Probabilities; 6, Decision Theory; 7, Uniformity Criteria for Selecting Decisions; 8, Exponential Families; 9, Many Normal Means; 10, The Multinomial Distribution; 11, Asymptotic Normality of Posterior Distributions; 12, Robustness of Bayes Methods; and, 13, Nonparametric Bayes Procedures.. First Edition, First Printing. Hard Cover. Near Fine/No Jacket. Princeton, NJ: Brandon/Systems Press, 1970. Stated First Printing. Text/BRAND NEW. Forest-green linen boards/NF. DJ/None. Pen marks on lower text edge. Monograph; use of statistical data in business decisions. Portions of the text first published in the journal Industrial Canada. Contents in 16 chapters: 1, Introduction; 2, Averaging; 3, Data Patterns; 4 & 5, Variability; 6. Sampling; 7, Graphic Analysis; 8, Multifactor Analysis; 9, Variations Tracing; 10 & 11, Analysis of Relationships; 12, Control Chart Methodology; 13, Strategy Under Risk & Uncertainty; 14. Decision Making & the Computer; 15, Systems-Integrated Planning; and, 16, Management Information Systems. Glossary of statistical terms to rear. Fine copy.. First Edition, First Printing. Hard Cover. Near Fine/No Jacket. New York, NY: John Wiley, 1959. Text/BRAND NEW. Laminated soft cover/NF. PO name on fEP & upper text edge. Trace soiling to upper/lower text edges. Using mathematical models in operations decision making based on a one-semester. course lectures given at Case Institute of Technology. Prerequisite: working knowledge of the differential and integral calculus. Brief survey of probabilty/statistics precede inventory, replacemnt waiting lines, competive strategies, allocation, sequencing, and dynamic programing. Suitable for students of industrial engineering, statistics, economics, and applied mathematics. Fine reference and review.. First Thus. Soft Cover. Near Fine/None as Issued. New York, NY: Dover, 1971. Text/BRAND NEW. Illustrated soft cover/NF w/trace discoloration to lower back edge. True to its title, the volume is a straightfirward account of methods of extracting information from numerical data. All procedures are illustrated with examples with plenty of questions/answers regarding the described techniques. Excellent discourse on "how not to be misled by numbers.". Reprint. Soft Cover. Near Fine/None as Issued. New York, NY: Spartan Books, 1968. Text/BRAND NEW. Pale gray linen boards/Fine. DJ/VG; closed tears, nips, chips to edges & tendency to curl to upper front edge. Laid-in: ERRATA LIST. Unsual book based on the premise that game playing is an excellent media in which to master computer programming. Suitable for system analysts and mathematicians. Volume considers some 70 odd games with 25 complete programs written in FORTRAN or BASIC, 16 chapters presented in 3 parts: 1, Game Playing with Computers; 2, Magic Square Programs; 3, Prime Numbers, 4, Binary Games; 5, Puzzles; 6. Miscellaneous Game Programs; 7, Casino Games; 8. Board Games; 9, Magic Squares; 10, Number Games; 11, Unsual Gambling Games; 12, Miscellaneous Games; 13. Game Playing with a Time-Sharing System; 14, Betting Games; 15, Random Numbers, and, 16, Electronic Games. Disciplined intellectual exercises. Fine copy in lesser dust jacket.. First Edition, First Thus. Hard Cover. Near Fine/Very Good. By Bails, Dale G; & Peppers, Larry C.
Englewood Cliffs, NJ: Prentice Hall, 1981. Text/BRAND NEW. Illustrated boards/NF w/light rubs to corner tips & upper/lower spine edges. Trace soiling to upper corner tips. Textbook. Master's-level students with at least two semesters of economics, and two or more semesters of statistical techniques and quatitative methods. Text in 6 parts comprised of 11 chapters. The parts are: Part I, Overview of Forecasting & Business Cycles; II, Classical Time-Series Decomposition; III, The Two-Variable Regression Model; IV, The Multiple Regression Model; V, Time-Series Models; and, Part VI, Translating the Forecast for Managment, followed by 9 appendices.. First Edition, 3rd Printing. Hard Cover. Near Fine/None as Issued. New York, NY: Dover, 1989. Text/BRAND NEW. Illustrated soft cover/NF. Dover reprint of 1957 published under the title: A Study of the Behavioral Models Project, Bureau of Applied Social Research, Columbia Univ. Written for non-mathematicians, a book about the game theory, not a presentation of the theory itself. Text in 14 chapter followed by extensive appendices. Fine copy.. Dover Reprint. Paperback. Near Fine/None As Issued. New York, NY: McGraw-Hill, 1975. Text/VG; Near New w/some folded corners and paperclip shadow to pg 211. Red soft cover/VG w/light rubs to edges & corner tips. 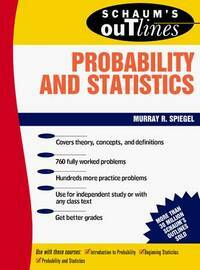 Excellent, lucid guide to fundamental mathematical concepts underlying probability and statistics. Text augmented by some 750 problems with worked-out solutions. Fine reference and resource.. 15th Reprint of 1979. Paperback. Very Good/None as Issued. By Moore, David S.; McCabe, George P.
New York, NY: W.H. Freeman, 1989. Text/Near New. Illustrated boards/NF. DJ/None As Issued. 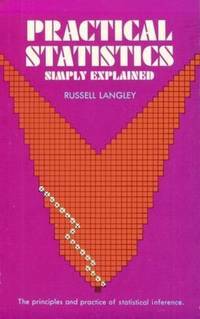 Introductory textbook to modern applied statistics, presuming only working knowledge of algebra. Focus is on basic statistical reasoning and data evaluation. Text in 11 chapters: Chapter 1. Looking at Data: Distributions; 2, Looking at Data: Change & Growth; 3, Looking at Data: Relationships; 4, Producing Data; 5, Probability: The Study of Randomness; 6, From Probabilty to Inference; 7, Introduction to Inference; 8, Inference for Distributions; 9, Inference for Count Data; 10, Inference for Regression; and, 11, Analysis of Variance. Fine copy.. First Edition, 2nd Printing. Hard Cover. Near Fine/None As Issued. Boston, MA: Prindle Weber & Schmidt, 1979. Text/VG; tidy pencil markings to table of contents, and pencil underlining to pgs 4 & 5, balance brand new. Hi-gloss light mustard boards w/red lettering/Fine. DJ/ None (As Issued?). 15 chapters: Chapter 1, What is Statistic? ; 2, Useful Mathematical Notation (Optional); 3, Describing Distributions of Measurement; 4, Probability; 5, Radom Variables & Probability Distributions; 6. The Binomial Probability Distribution; 7, The Normal Probability Distribution; 8, Large-Sample Statistical Inference; 9. 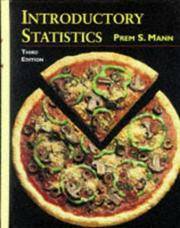 Inference from Small Samples; 10, Linear Regression & Correlation; 11, Analysis of Enumerative Data; 12, Considerations in Designing Experiments; 13, The Analysis of Variance; 14, Nonparametric Statistics; and, 15, A Summary & Conclusion.. 5th Edition, 7th Printing of 1982. Hard Cover. Very Good/None (As Issued?). By Johnson, Richard A.; Bhattacharyya, Gouri K.
New York, NY: Wiley, 1986. BRAND NEW Copy. DJ/None as Issued. Textbook. Basic statistics for one-semester or two-quarter courses, intended for students without strong mathematical background. Text covers principles and methodology in data collection, summarizing/interpretation of data, and the drawing of conclusions. 16 chapters: 1, Introduction; 2, Organization & Description of Data; 3, Descriptive Study of Bivariate Data; 4, Probability; 5, Probability Distributions; 6, The Binomial Distribution & Its Application in Testing Hypotheses; 7, The Normal Distribution; 8, Variation in Repeated Sample - Sampling Distributions; 9, Drawing Inference from Large Samples; 10 Small-Sample Inference for Normal Populations; 11, Comparing Two Treatments; 12, Regression Analysis I (Simpled Linear Regression); 13, Regression Analysis II (Multiple Linear Regression & Other Topics); 14, Analysis of Categorical Data; 15, Analysis of Variance (ANOVA); and, 16, Nonparametric Inference, followed by appendices & tables.. Revised Printing. Hard Cover. New/None As Issued.